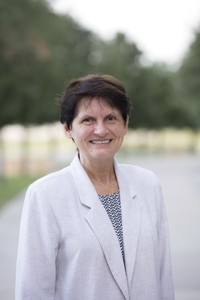 Baylor>Department of Religion>Our Faculty>Faculty>Lidija Novakovic, Ph.D.
A native of Croatia, Dr. Novakovic has been living in the USA since 1995. She joined the faculty in the Department of Religion at Baylor University in 2007, having taught previously at Bethel University in St. Paul. She is the author of three monographs and a co-editor/contributor of three additional books. She also serves as General Editor of the Baylor Handbook on the Greek New Testament (BHGNT) Series published by Baylor University Press. She is married to Dr. Ivo Novakovic, who teaches in the Baylor Interdisciplinary Core. The Gospel of Matthew; the Gospel of John; the Old Testament in the New; the Dead Sea Scrolls and other Jewish writings from the Second Temple period; resurrection belief in Judaism and Christianity. Current Project: A handbook on the Greek text of the Gospel of John for BHGNT Series published by Baylor University Press. Resurrection: A Guide for the Perplexed. London/New York: Bloomsbury T&T Clark, 2016. Interpretation & the Claims of the Text: Resourcing New Testament Theology. Edited with Jason A. Whitlark, Bruce W. Longenecker, and Mikeal C. Parsons. Waco: Baylor University Press, 2014. Raised from the Dead According to Scripture: The Role of Israel’s Scripture in the Early Christian Interpretations of Jesus’ Resurrection. Jewish and Christian Texts in Contexts and Related Studies Series 12. London/New York: Bloomsbury T&T Clark, 2012. Messiah, the Healer of the Sick: A Study of Jesus as the Son of David in the Gospel of Matthew. Wissenschaftliche Untersuchungen zum Neuen Testament II/170. Tübingen: Mohr Siebeck, 2003. The Dead Sea Scrolls: Hebrew, Aramaic, and Greek Texts with English Translations. Vol. 3: Damascus Document II, Some Works of the Torah, and Related Documents. Edited with J. H. Charlesworth, H. W. M. Rietz, J. M. Baumgarten, C. Claussen, D. A. Hume, J. B. F. Miller, S. Pfann, E. Qimron, and L. L. Johns. Tübingen: Mohr Siebeck, 2006. The Dead Sea Scrolls: Hebrew, Aramaic, and Greek Texts with English Translations. Vol. 6B: Pesharim, Other Commentaries, and Related Documents. Edited with J. H. Charlesworth, H. W. Rietz, and C. D. Elledge. Tübingen: Mohr Siebeck; Louisville: Westminster John Knox Press, 2002. "Pesharim” and “Habakkuk Pesher.” In Early Jewish Literature: An Introduction and Reader. Edited by Archie Wright et al. Grand Rapids: William B. Eerdmans. [forthcoming in 2016]. "Healing Miracles in Second Temple and Hellenistic Judaism.” Pages 481–483 in Encyclopedia of the Bible and Its Reception (EBR), Volume 11. Berlin: Walter de Gruyter, 2015. “The God Who Raised Jesus from the Dead: Toward a Theology of Resurrection.” Pages 17–28 and 218–221 in Interpretation & the Claims of the Text: Resourcing New Testament Theology. Edited by Jason A. Whitlark, Bruce W. Longenecker, Lidija Novakovic, and Mikeal C. Parsons. Waco: Baylor University Press, 2014. “Jesus’ Resurrection and Historiography.” Pages 910–933 in Jesus Research: New Methodologies and Perceptions: The Second Princeton-Prague Symposium on Jesus Research, Princeton 2007. Edited by James H. Charlesworth with Brian Rhea and Petr Pokorný. Grand Rapids: William B. Eerdmans, 2014. “The Scriptures and Scriptural Interpretation.” Pages 85–101 in The World of the New Testament: Cultural, Social, and Historical Contexts. Edited by Joel B. Green and Lee Martin McDonald. Grand Rapids: Baker Academic, 2013. “Jews and Samaritans.” Pages 207–216 in The World of the New Testament: Cultural, Social, and Historical Contexts. Edited by Joel B. Green and Lee Martin McDonald. Grand Rapids: Baker Academic, 2013. “Rereading the Past: Memory and Identity in Post-Communist Croatia and the Genealogy of Jesus in the Gospel of Mathew.” Pages 9–23 in Matthew: Texts @ Contexts. Edited by Nicole Wilkinson Duran and James P. Grimshaw. Minneapolis: Fortress Press, 2013. “זָכַר zākar.” Pages 840-849 in Theologisches Wörterbuch zu den Qumrantexten. Edited by Heinz-Josef Fabry and Ulrich Dahmen. Stuttgart: Kohlhammer, 2011. “Miracles in Second Temple and Early Rabbinic Judaism.” Pages 95-112 in The Cambridge Companion to Miracles. Edited by Graham H. Twelftree. Cambridge: Cambridge University Press, 2011. “‘Yet Even the Dogs Eat the Crumbs that Fall from Their Masters’ Table’: Matthew’s Gospel and Economic Globalization.” HTS Teologiese Studies/Theological Studies 65.1 (2009), Art. #321, 7 pages, DOI: 10.4102/hts.v65i1.321. “The Decalogue in the New Testament.” Perspectives in Religious Studies 35.4 (2008), 373-386. “Matthew’s Atomistic Use of Scripture: Messianic Interpretation of Isaiah 53.4 in Matthew 8.17.” Pages 147-162 in Biblical Interpretation in Early Christian Gospels. Volume 2: The Gospel of Matthew, Edited by Thomas R. Hatina. Library of New Testament Studies 310. London: T&T Clark International, 2008. “4Q521: The Works of the Messiah or the Signs of the Messianic Time?” Pages 208-231 in Qumran Studies: New Approaches, New Questions. Edited by Brent A. Strawn and Michael T. Davis. Grand Rapids: William B. Eerdmans, 2007. View Dr. Novakovic's CV and Books.